Identification: House mice have light brown to dark grayish brown fur with a lighter underside. With relatively large ears, they range in length from 130mm to 190mm; the tail being 63 to 102mm of the total length. The tail is annulated and scantily furred. The house mouse can be distinguished from the New World Mice by it unnotched incisors. Original Distribution: Mus musculus are natives of Central Asia but spread through Europe hundreds of years ago. Current Distribution: The House Mouse is now found throughout the world including Australia and the Oceanic Islands. Since the House Mouse is commensal with humans, it is generally found in buildings or cultivated fields. It is uncommon in undisturbed or natural habitats. Site and Date of Introduction: The House Mouse first arrived in the Americas in the early sixteenth century. It was carried aboard on the ships of Spanish explorers and Conquistadors. About one hundred years later, it arrived in North America with the French fur traders and the English colonists. Mode(s) of Introduction: The introduction of the House mouse has been primarily due to early ship traffic between Europe and the Americas, and later, ship traffic to the English colonies in the Pacific. Recently, House mice have been unintentionally introduced into some urban parks by individuals "liberating" lab animals. Reason(s) Why it has Become Established: Because of its close association with man, migratory existence and high reproduction rate, the House Mouse has been able to colonize habitats which would have been considered inhospitable such as tundra and deserts. Being opportunistic, they are able to take advantage of temporary habitats such as cultivated fields. As crops mature, the mice will move in and have multiple litters in quick succession. Within 12 to 18 hours after giving birth, the female is able to mate again. Upon harvesting, they will abandon the site and move on to either new fields or buildings. In 1926, Central Valley of California experienced a mouse migration of epic proportions. An estimated 82,000 mice overran the Valley, causing massive damage. In suburban settings, house mice will nest in inaccessible locations, behind rafters, in plumbing, and wood piles. Mice are able to squeeze through gaps slightly wider than 1/4" , so older buildings are especially attractive to them. Mice are also excellent climbers and can scale rough vertical walls and pipes. Though average lifespan in the wild is less than a year and a half, 12 to 18 months, a female will generally bear 5 to 10 litters per year if conditions are conducive. Ecological Role: In the wild, mice will set up individual nests but will share collective areas for defecation and eating and will have a common escape route. They are nocturnal and in temperate climates make their homes in dense vegetation along irrigation ditches and in fields. As a commensal animal, House mice will inhabit granaries, feed houses, and stores, barns and homes. They are omnivorous and will consume seeds, roots, leaves and insects. They have been known to feed off of carrion when it is available. 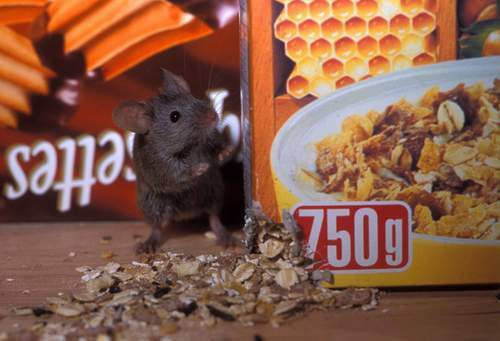 In human habitations, mice will eat almost any human food or livestock feed that is accessible but prefer cereal grains. Mice have also been known to eat soap as well as glue. Mice are only considered territorial when living in close proximity to humans. The dominant male will set up a territory with several females. Males and females reach sexual maturity at 5 to 7 weeks. The estrous cycles is approximately 4 to 6 days with the female giving birth to litter of 3 to 12 after a gestation of 19 days. Young mice are born blind nearly furless. At 3 weeks, they are fully weaned. Benefit(s): House mice are used in laboratories as a model for human diseases of the immune system and aging. Currently under way is a project to map the entire genome of the mouse. Mice have been kept as good luck charms and to predict the future by Egyptians and the ancient Chinese. The Cretans built a temple to the House mouse more than 4,000 years ago as a tribute for their victory over the Pontus (Biefeld. 7). The Japanese have been selectively breeding mice for over 300 years. Mice are kept as pets and shown at county fairs. And of course, Mickey Mouse has been enthralling generations of children for over 50 years. Threat(s): Although house mice do not pose as great an economic problem or health risk as rats, they are implicated in the transmission of diseases, rickettsial pox, tularemia, salmonella and bubonic plague. They have been known to cause contamination of livestock feed and human food. They have also been known to cause damage to structures and property with gnawing and tunneling. Mice have been implicated in the generation of fires by gnawing through electrical lines. Control Level Diagnosis: Although a highly invasive species, House mice are not nearly so destructive as rats therefore they pose a low to medium threat. They have not been implicated in the reduction of any native species nor compete with new world rodents but they do pose a risk to human health as they are a vector for many diseases. House mice are not carriers of the Hanta Virus. 1) Sealing around pipes, vents and utility cables with concrete. 2) Edges of doors and windows should be fitted with metal to prevent entry by gnawing. 3) Plastic or light weight metal screening is unsuitable for plugging holes. Traps are effective for controlling small numbers of mice but are ineffective and time consuming with larger populations. Baits have also been effective control but because of their use of rodentcides pose a threat to pets and small children. On e of the major rodentcides in use is Warfarin, which is an anticoagulant that prevents clotting in mammals. While the bait requires multiple dosing for death to occur, it can cause death in pets, livestock or desirable wild life if not carefully monitored (UC Pest Management Guidelines. 3). Additionally, residues may be present in the bodies of rodents which could cause toxic effects to scavengers and predators. Whitaker, John. The Audubon Society Field Guide to North American Mammals. New York: Knopf, Inc. 1991. Mouse with cracker boxes, Rollin Verlinde 200-2003.